Waveney Eye Care NI is a family owned business. 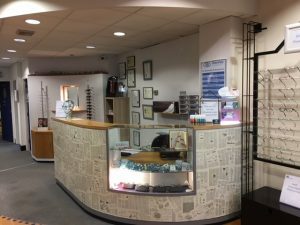 Roger & Emma are both fully qualified Optometrists with nearly 40 years experience between them working in independent practice, large national opticians and hospital clinics. Our team includes Teresa (optometrist), Sandra (administrator), Natalie (assistant manager) and Andrea (dispensing optician). We have a special interest in paediatric optometry and our three young children often give us advice when it comes to ordering in children’s frames!